So I've got a bad habit of making food items outside of their desired season. First I'm hitting you with pumpkin cinnamon rolls, now I'm on about muffins. I even made the applesauce from scratch (just boil them up with a touch of cinnamon, lemon juice and vanilla!) and the house smelled like autumn. In Ireland, its easy to forget its not truly summer, its just, a little warmer than the rest of the year. 1/4-1/2 tsp cinnamon (depends on how much you like cinnamon, my applesauce had some cinnamon already so I stuck with 1/4 tsp and it was just enough of a pinch). - Mix sugar, vanilla, egg, yogurt and applesauce well. - Add wet to dry, and fold together until the whole mixture is wet. The key will fluffy muffins is not to overmix. Bake for 20 minutes at 350F/180C. Smear with butter while warm and enjoy! See that pan with all the staining? Well used! These silicon muffin cups are the business, just to let you all know. I'm happy to make my cupcakes for the family in them as well! 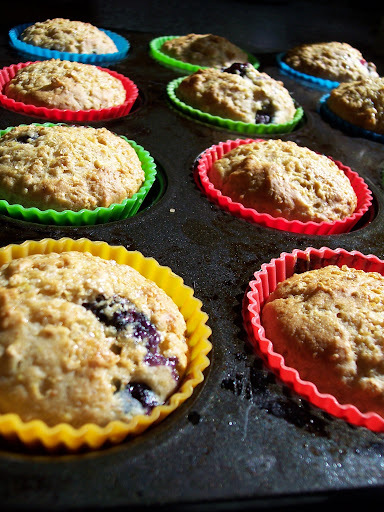 Do you have those silicone muffin cups? Yes! Those are what are in the picture. They are fantastic. 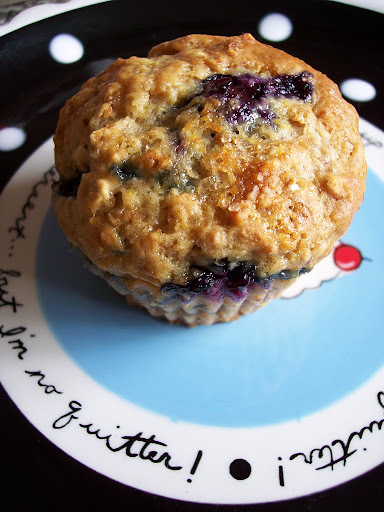 I found this recipe via Tastespotting and made it today-- sans wheatgerm and with 1c blueberries and 1 cup diced apple...delicious! Hearty, not too sweet...and best of all not too punishing for the waistline. These would be great as a breakfast snack or dolled up with a thin glaze of icing.